Touching art objects in an exhibition space is usually not allowed. Not so in Kay Walkowiak’s Minimal Vandalism, where this prohibition is practically stomped on. The setting, the Generali Foundation in Vienna is the epitome of a modernist exhibition building, which – as neutral White Cube-like shell – is meant to intervene as little as possible in the act of viewing art. Well, other than the tube-like enfilade with the massive concrete wall running down the middle along which a parcours of minimalist sculptures is set up in Minimal Vandalism. And it truly is a parcours, as after a brief exposition, in which the jerky camera movements already lead us to suspect that something’s up, an entirely unexpected performance unfolds. 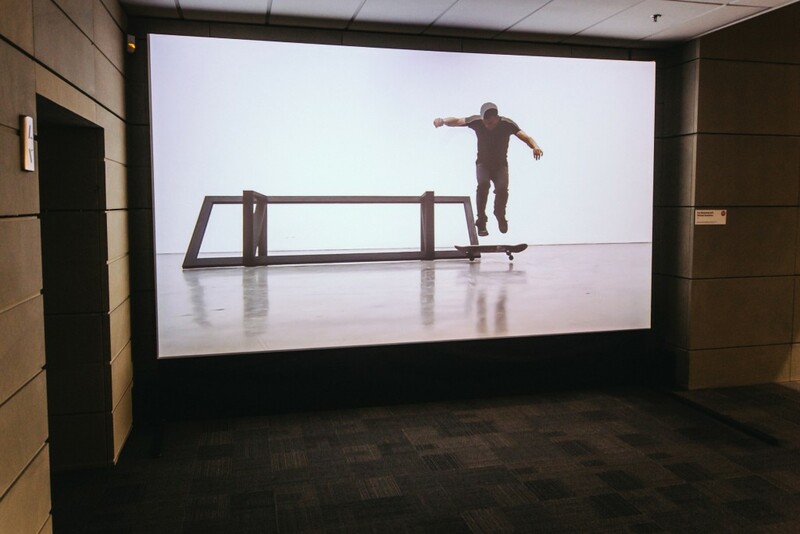 In one of the few calm takes, a surveillance camera soon becomes visible and the show begins: a skateboarder (Kilian Martin) coming from the depths of the room makes his approach on three boards piled on top of one another, to subject the sculptures to a test of endurance, or skill. The “performer” relentlessly includes the objects in his acrobatics, regardless of the fact that they are art, gliding up onto them, sliding across their surfaces, and daringly jumping over them. The whole thing is staged with a powerful, echoing sound that additionally breaks the silent impression of the minimal sculptures. In a dynamic change of takes, after every performed act, close-ups show the damage that has been caused. But here, too, it seems as though the objects are brought to life rather than ruined by the bizarre scratches, skid marks, and spiky metal burs. The gaze moves through the space several times, along the frosted glass ceiling and the streaked magnesite stone floor – the short, abrupt skateboard runs, however, constantly end there where the actual addressee is: the abstract art pieces, which are shaken from their contemplative rest by such sporty vehemence. Kay Walkowiak (AT), born 1980, studied philosophy and psychology at the University of Vienna, photography and video art at the Academy of fine Arts, Vienna and art & communication and sculture & multimedia art at the University of Applied Arts, Vienna. He is the recipient of several grants and awards, such as the Theodor Körner Preis (2010), Otto Prutscher award (2008), Fred Adlmüller scholarship (2006) and artist-in-residence grants in Banff (2014), Beijing (2013) and Varansi (2013, 2015). He lives and works in Vienna.